CLICK to view an interactive AVA map of Washington State and learn about different weather conditions that make each AVA different. Winemakers from all over the world have chosen to establish operations in Washington, where they can create wines from grapes that reflect this region's unique characteristics. Primarily grown on their own root stocks, Washington state vines produce grapes of consistent quality, resulting in strong vintages year after year. Each of our 13 AVAs is defined by its specific climate, soil and physical features. Mostly whites - Chardonnay and Riesling – some red varieties. We work with all the AVAs to connect you to the best of what they grow. 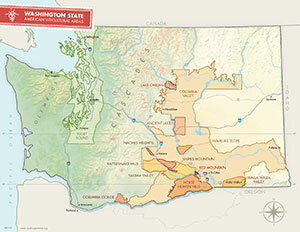 Learn more about the Washington grape growing regions.